We're aware of a bug that is currently affecting some users' ability to personalize SwiftKey from their Twitter account. We believe this may have been caused by changes Twitter made to its authentication process. We're currently looking into a potential fix but apologise for any inconvenience in the meantime. Please leave a comment below if this is happening for you. Unfortunately, we are no longer able to support SwiftKey on Android KitKat devices. You can check your Android version number by visiting your phone Settings. Depending on your phone you'll then tap into the System or About menu. Android KitKat version numbers range from 4.0-4.4. We want to make sure you have a great SwiftKey experience and we can no longer provide that on Android KitKat and below. As SwiftKey and Android have grown over the years, the best SwiftKey experience can be had on newer versions of Android. In SwiftKey 7.2.6 we introduced a new way to resize your SwiftKey Keyboard. To use: Simply drag the boundary boxes to resize and move. This will enable you to position your SwiftKey Keyboard just how you want it. It will also assist users whose devices hide the chin/navbar, as it will allow your SwiftKey Keyboard to sit higher on your screen. If things still don't look quite right please uninstall the SwiftKey Keyboard (no need to clear your cache/data too) and download SwiftKey again. SwiftKey uses Artificial Intelligence to automatically learn your writing style, the words that matter to you and how you like to type. We're always striving to improve our algorithms, deliver increasingly personalized autocorrect and predictive text that adapts to you. To do this we need your help. We'd like to be able to capture snippets of your data. Specifically words, the phrases and context it was used and how you input text whether you tap words or swipe (flow) them. In order to protect your data and privacy, we ensure that we anonymize all the information captured as part of this process. You can choose to opt out at any time via your SwiftKey settings. 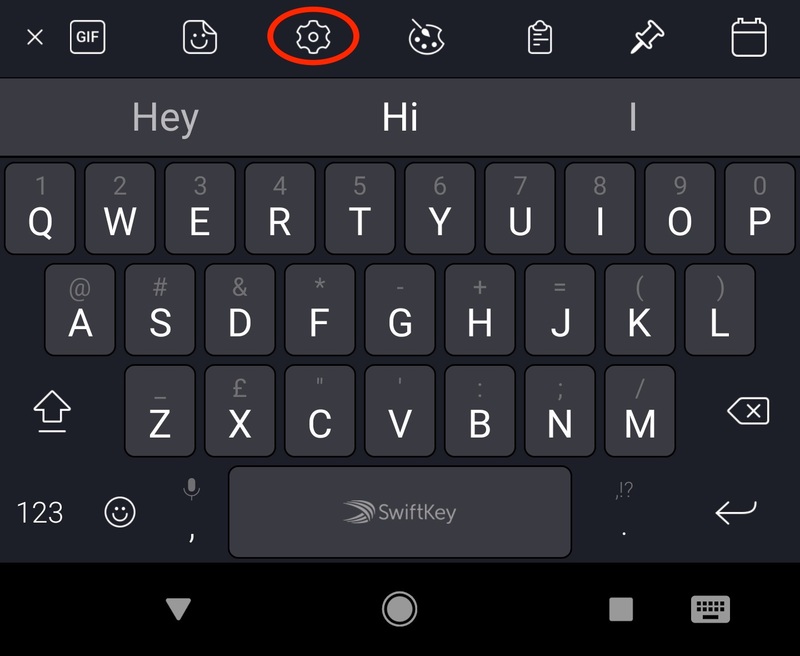 How do I personalize my typing with SwiftKey Keyboard for Android? Personalization allows you to “teach” SwiftKey Keyboard more about your personal dictionary and style by learning from your social accounts. SwiftKey will use your message archives from Facebook, Twitter, Gmail, and Google+ to better offer your tailored predictions and corrections. To set up the Personalization options, you will need to sign into your SwiftKey Account. If you haven't already done so, this article will show you how. Please note that personalizing from one of these accounts learns data from what you have done in the past. It will not continue learning. Therefore you may periodically want to update your language model - to do this just tap the account to re-personalize. In order to deliver the benefits of the SwiftKey Account, certain personal data may be shared with our servers. For example, this allows your personal language profile and theme records to be synced across devices. This is an opt-in service, and any user profile may be deleted at any time. You can learn more by reading our article on Privacy Questions and Your Data. 1 - What is Backup & Sync? If you are signed in to your SwiftKey Account and have enabled Backup & Sync then the words and phrases that matter to you are backed up securely and seamlessly synced across all of your devices. If your mobile or tablet is upgraded, lost or stolen, your personal profile is kept safe in the cloud, giving you the personalized SwiftKey experience within seconds of installing the keyboard on a new device. Never again lose your learned language and words! Even if you update or uninstall SwiftKey, or lose/upgrade a device, with Backup & Sync enabled, your SwiftKey Account will retain all your personal language data. The next time you use SwiftKey, all you need do is sign into your same SwiftKey Account and get typing! Your most current words and phrases will be available on all devices signed into your SwiftKey Account. Entering a new word or phrase on one device will automatically sync up to all of your other connected devices. The Backup & Sync screen will tell you when your data was last saved to the Cloud. To manually perform a sync just tap the circular arrow icon. 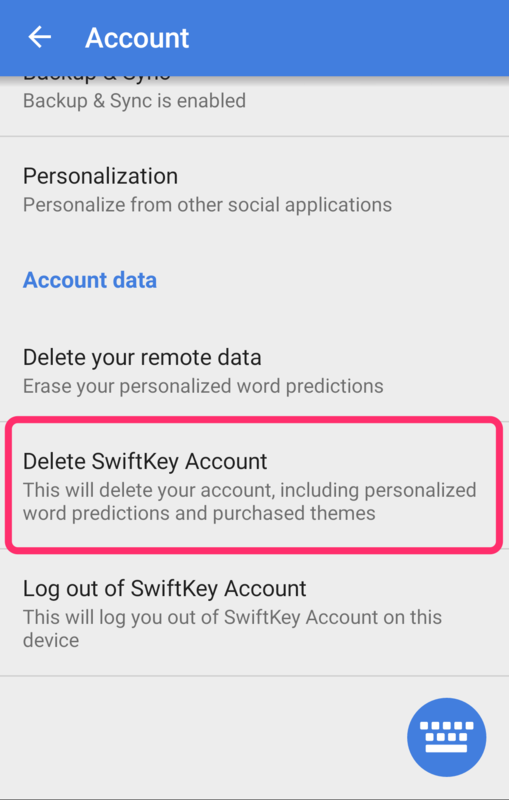 Please note that disabling Backup & Sync will not automatically remove your SwiftKey Account data. If you would like to clear your data, you will need to do this separately. For information on how to do so, please see the article, How do I clear my learned language data?. Does SwiftKey collect personal data like credit card numbers and passwords? SwiftKey is predicting my password - how do I stop it doing this? First, please note that unless you have opted in to use a SwiftKey Account on your Android device, all personal and language data generated by SwiftKey is stored locally on your device and is never transferred. What about credit card numbers and passwords? SwiftKey does not learn anything from fields marked as password fields, nor does it remember long numbers such as credit card numbers. The warning message from Google that says SwiftKey may be able to collect ‘all the text you type, including personal data like passwords and credit card numbers’ (pictured below) is a part of the Android operating system that appears when any third party keyboard is enabled. SwiftKey is designed never to learn from or predict what you enter in a specified password text field. It is up to the website or application you are logging into to build that specification into the field. If you find your password is being predicted, you can easily remove the word from SwiftKey’s dynamic language model by longpressing on the word in the prediction bar when it is shown and tapping ‘Remove’. 2 - How do I remove my remote data? Now, no potentially personal data will be sent to SwiftKey through Backup & Sync or Personalization services. 3 - How do I delete my local language model stored on my device? 4 - How do I log out of my SwiftKey Account? 5 - How do I remove my SwiftKey Account? Please note that this will erase all your personalized word predictions and make it impossible to reach any of your previously purchased content. By law we must retain a record of your transactions and purchases, but these purchases will no longer be associated with your account. 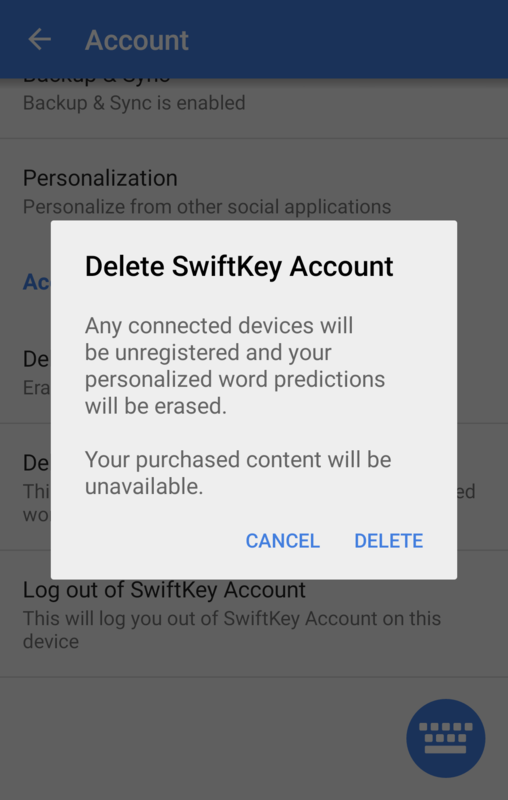 Deleting your SwiftKey Account and data will not affect your dynamic language model stored on your device. 6 - How do I unsubscribe from SwiftKey product emails? To unsubscribe, please follow the steps below. Additionally, you can also unsubscribe by clicking the link at the bottom of the email you receive after installing SwiftKey. 7 - How do I turn off notifications for SwiftKey? There are occasionally notifications for tips (how to get the most out of SwiftKey) and achievements (how many keystrokes SwiftKey has saved you). SwiftKey allows you to use up to five languages simultaneously. We’ve enhanced our multilingual support framework to make it even more effective, by constantly scanning input text to estimate which of the enabled languages are being used, and adjusting predictions accordingly. SwiftKey currently supports 300+ languages on Android. Click here to see the full list. For languages with the same alphabet/layout, there is no need to switch between languages - you just start typing and SwiftKey figures out which language you are using! For languages with different alphabets (i.e. English and Russian), simply slide left or right on the spacebar to switch between them. Tap the circular arrow in the top-right corner of the app to update all installed Language Packs. (Alternatively, you can always update a Language Pack manually should an 'Update' prompt appear). In order to accommodate for multiple languages SwiftKey offers a number of different keyboard layouts. What do I do if I've lost my learned language data? This should help restore your learned language data. Where is the Ñ key with SwiftKey Keyboard for Android? For users typing in Spanish, once you have downloaded the Spanish language pack, if you are not seeing a dedicated Ñ key, just long press on the N key and you will see it appear. If you wish to have a dedicated Ñ key, follow the steps below. Tap the box underneath the Spanish language pack and change the layout to QWERTY (Spanish). When you next use the keyboard your keyboard should show QWERTY (Spanish) with a dedicated Ñ key. SwiftKey works with some physical (Bluetooth) keyboards, but with hundreds of different models available functionality will vary. Once you've successfully paired your keyboard to your device you'll be able to access the physical keyboard settings from within SwiftKey. Open your 'Bluetooth' settings and tap on the keyboard you want to add. You might be asked to type a code on your keyboard to confirm the pairing. After a successful pairing, a Notification may appear that prompts you to configure the keyboard. If this doesn't happen you can go your device's 'Languages & Input' menu and tap 'Physical keyboard'. You'll need this to set your language settings as explained below. Your physical keyboard doesn't inherit SwiftKey's layout settings. Instead you have to set them separately. Open your device's 'Settings' menu. Now look for 'Languages & Input' (depending on your model this might be worded slightly differently). Find your keyboard model, and tap on 'SwiftKey Keyboard'. Choose the layout you want your physical keyboard to type with. You're still able to select up to five languages for use through the SwiftKey 'Languages' menu. We've added a number of keyboard shortcuts to SwiftKey when using an external keyboard. Press 'Ctrl+up/down' arrow key to expand/shrink the prediction bar when using Asian languages. Press 'Ctrl' followed by a number (1-9) to insert the respective prediction. From Android 7.0 onwards your device will also have its own selection of shortcuts available. To see a full list tap on the 'Keyboard shortcuts helper' prompt in the Android Keyboard assistance menu. If your Bluetooth keyboard experience looks different or your keyboard shortcuts aren't working, please ensure you're using the latest version of SwiftKey available in the Google Play Store. To hide the onscreen SwiftKey Keyboard please see this article. Using a BlackBerry? These keyboards don't fall into our Bluetooth/physical keyboard classification and therefore can't be used in this way. We've added Search to your SwiftKey Toolbar to enable you to quickly search and share directly from your SwiftKey Keyboard. What is Search for SwiftKey Android? Why can't I see Search in my SwiftKey Toolbar? How do I delete my Search history? What happens if I type in a URL? Can I Search using Incognito Mode? I have an iPhone can I get Search too? 1 - What is Search for SwiftKey Android? With Search you're able to quickly find and share anything from the web on your keyboard. There’s no app-switching so you don't even need to leave the conversation. SwiftKey uses Bing to surface Search results, then you can choose either to send the whole page or take a screenshot of part of the page to share with your contacts. All users running SwiftKey 7.2.3 and above are able to access the Search feature from their Toolbar. Your Search results will be displayed over your SwiftKey Keyboard. Now you can either send the result to your contacts or take a screenshot. This will share the whole Search results page with your contact as a link. Use the screenshot tool to crop Search results and share snippets of webpages with your contacts. Drag the edges of the boundary box to crop part of the webpage. (You can hit 'Reset' if you make a mistake). Tap 'Send' when you're happy with your selection. Please ensure you have updated your SwiftKey Keyboard to at least 7.2.3 in order to use Search. We're sorry but Sony devices do not support Search. Can I choose my Search provider? SwiftKey has added flexibility for you to select between Bing and Google based on your personal preferences. You can select between these two options by tapping the 'Settings' cog on your Toolbar > 'Search Engine'. We display your three most recent Searches in the Search box. Long press on a Search query to remove it from your history. The Search box also works as a web browser, so you can type in a website URL and browse the web from your SwiftKey Keyboard. Yes. If Incognito is active on your SwiftKey Keyboard, we will respect your preferences when opening the embedded browser with your Search results. For the moment Search is only available on our SwiftKey Keyboard for Android. What versions of Android OS does SwiftKey Keyboard support? How do I find which version of SwiftKey I’m using? How do I upgrade to the latest version of SwiftKey? I’ve installed SwiftKey, so why does the keyboard on my phone look the same? Please make sure you've finished the installation process after downloading the app from the Google Play Store. Click here for more information. Note: To switch between keyboards while typing, just tap the keyboard icon in your notification bar. Why can't I see SwiftKey in the Google Play Store? If you can’t see SwiftKey in the Google Play Store, this most likely means that you're in a territory where the Google Play Store is not offered. Can I install SwiftKey on more than one device? SwiftKey is a free app, so you can install it on as many devices as you like. As long as you are signed into your SwiftKey Account you can sync your language model and themes to the new device as well. Can I move SwiftKey onto my SD card? Unfortunately, it’s not possible to move any input method like SwiftKey onto the SD card. This is an Android restriction, rather than a limitation on SwiftKey's end. If you previously downloaded SwiftKey from the Amazon App Store you should be aware that this version has long been discontinued. Although it may still work to a degree, we don’t actively offer support and therefore recommend you download the latest market release from the Google Play Store. Will SwiftKey Keyboard work with a custom ROM? SwiftKey does not officially support custom ROMs. As the Android ROM community is constantly growing, it makes it difficult for our teams to troubleshoot, diagnose and resolve issues. SwiftKey may work with your custom ROM, but unfortunately, we’re unable to guarantee any level of service or provide support beyond what you find in this knowledge base for standard versions of Android. 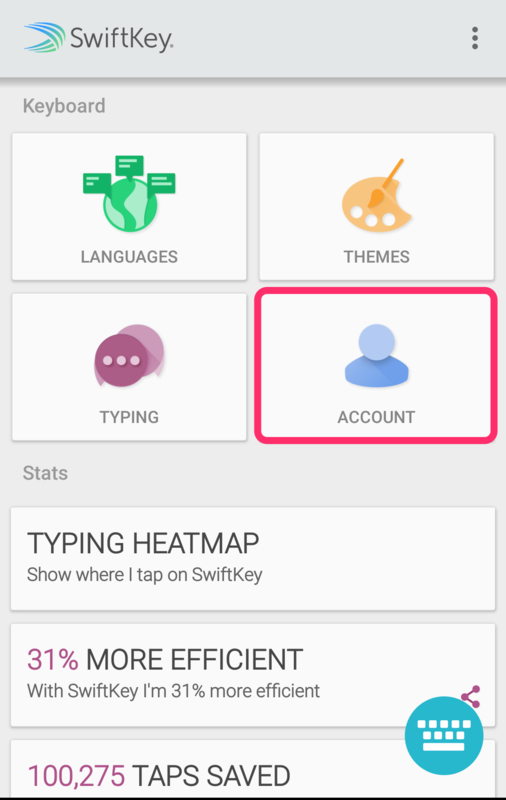 How do I install SwiftKey Keyboard for Android? Congratulations! You've downloaded SwiftKey from the Google Play Store. On first-run you'll be greeted with the SwiftKey onboarding experience. This will take you through the following three steps. Tap the green 'Enable SwiftKey' button. Your devices' Physical Keyboard screen will appear - tap the toggle next to 'SwiftKey Keyboard' to enable it. Press the 'Back' button on your device to return to the setup process. Tap the green 'Select SwiftKey' button. Your devices' keyboard selection menu will appear - tap to select 'SwiftKey Keyboard'. Tap the green 'Get better predictions' button. Over the next four screens we'll explain how Personalization works in SwiftKey - swipe to advance and discover how to: get better predictions, customise your look with themes, and protect your words with backup and sync. To take advantage of these Personalization features you're required to create a SwiftKey Account. But don't worry, this is as easy as one click! Just tap the 'Sign-in with Google' button. When you're done we'll take you to your new keyboard and suggest some areas which will allow you to further customise your SwiftKey experience. Thank you for your interest in Swiftmoji. Swiftmoji is no longer available in the Google Play Store. We recommend all Swiftmoji users try SwiftKey Keyboard for Android instead. Why is Swiftmoji no longer available in the Google Play Store? 1 - Why is Swiftmoji no longer available in the Google Play Store? This was a strategic decision by our team as we focus our resources on building the best possible experience with SwiftKey Keyboard for Android. If you’ve already downloaded the Swiftmoji app it will continue to work on your Android device. The only difference is it's not considered an “officially supported” app and you won't receive any new updates. Thank you for using Swiftmoji and we hope you enjoy using SwiftKey Keyboard for Android. If you found the emoji you wanted wasn't appearing on the emoji bar, tap the plus button to the right of the emoji bar to access more relevant emoji predictions and additional emoji categories. Swiftmoji was designed to be used with English only. It was available to download in the following countries UK, US, CA, AU, India, Ireland and New Zealand. Swiftmoji offered a range of customization options including themes, dark mode, resizing, keypress sounds/vibration, autocorrect settings, and Flow (swipe) among others. Access to these settings was achieved either by tapping the Swiftmoji icon on your home screen, or by long pressing the '123' key from the Swiftmoji keyboard. 5 - What was a Swiftmoji Account? Personalization: Swiftmoji learnt from the way you typed across a range of social networks (e.g. Facebook, Twitter, Google+). This improved Swiftmoji's accuracy (leading to better predictions!) as the app understood the words and phrases that mattered to you. Backup & Sync: Your Swiftmoji Account safely stored your learned language data and synced it across your devices. If you lost your phone or got a new one, you wouldn't need to retrain the keyboard - signing into your Swiftmoji Account brought all your personalized words right back.